Lillias White is an American singer and actress of stage, television, and film who is particularly admired for her performances in Broadway musicals. In 1989 she won an Obie Award for her performance in the Off-Broadway musical Romance in Hard Times. In 1992 she won a Daytime Emmy Award for Outstanding Performer in a Children's, Pre-School Children's or Family Viewing Program for her portrayal of Rhonda the pink singing squirrel on Sesame Street. In 1997 she won the Tony Award for Best Featured Actress in a Musical and Drama Desk Award for Outstanding Featured Actress in a Musical for portraying Sonja in Cy Coleman's The Life. She was nominated for a Tony Award again in 2010 for her work as Funmilayo in Fela Kuti's Fela!. White is also known for voicing Calliope on the Disney animated series Hercules, portraying Evette in the film Pieces of April, and for her work as Fat Annie (Cadillac's mother) in the Netflix series The Get Down. She has also starred as Bloody Mary in Rodgers and Hammerstein's South Pacific on PBS' Great Performances with Reba McEntire and in the PBS documentary In Performance at the White House. She is also an active cabaret singer and has appeared in concert with the Boston Pops Orchestra, the Brooklyn Philharmonic, and at Carnegie Hall. In the new single, "Stand Up Proud! An Anthem 4 Freedom," Broadway Powerhouse, Tony and Emmy Award Winner LILLIAS WHITE reminds us that "it takes guts to be free." 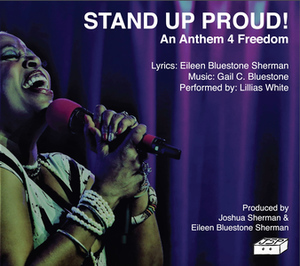 Composed by the Emmy Award-Winning "BLUESTONE SISTERS" (Gail and Eileen), the song is the official anthem for THE MILL'S first annual 4 FREEDOMS FESTIVAL℠ in Southern Vermont. Ms. White's electrifying vocals are a call to arms to protect 4 basic human rights. Of course, there's a great piece of history that inspired the song that most folks don't know.